By offc@admin#3sd on	 February 3, 2019 BTS concert BTS World Tour Hollywood Kim Namjoon! Kim Seokjin! Min Yoongi! Jung Hoseok! Park Jimin! Kim Taehyung! Jeon Jungkook! All right BTS Army, let’s start this thing by chanting BTS. Are you ready??? “Kim Namjoon! Kim Seokjin! Min Yoongi! Jung Hoseok! Park Jimin! Kim Taehyung! Jeon Jungkook! BTS!” Wohoo we did it. KPOP and BTS need no introduction in India. Starring RM, Jin, Suga, J-Hope, Jimin, V, and Jungkook, is the most successful boy band of all time. 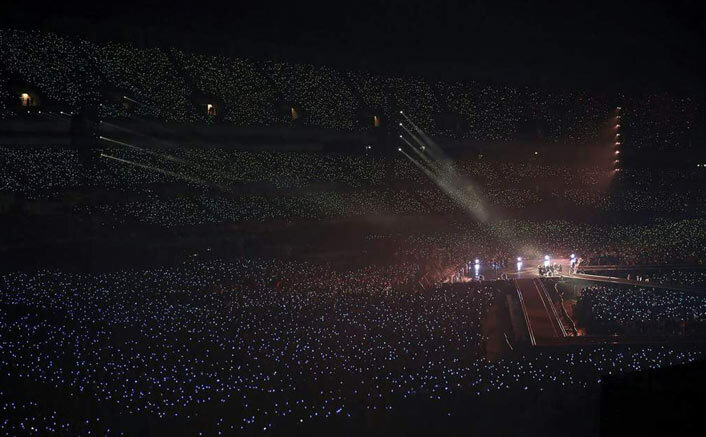 After successful premieres of Burn The Stage in India, they returned with yet another concert film BTS World Tour: Love Yourself in Seoul. 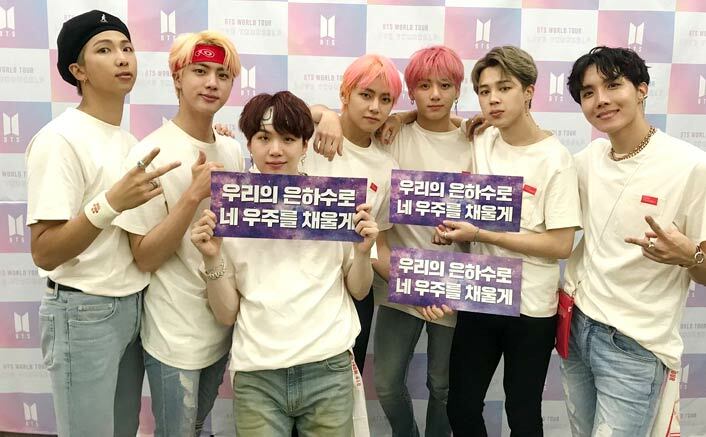 After screenings in select countries worldwide on January 26, BTS World Tour released in India yesterday as a One-Day screening event. 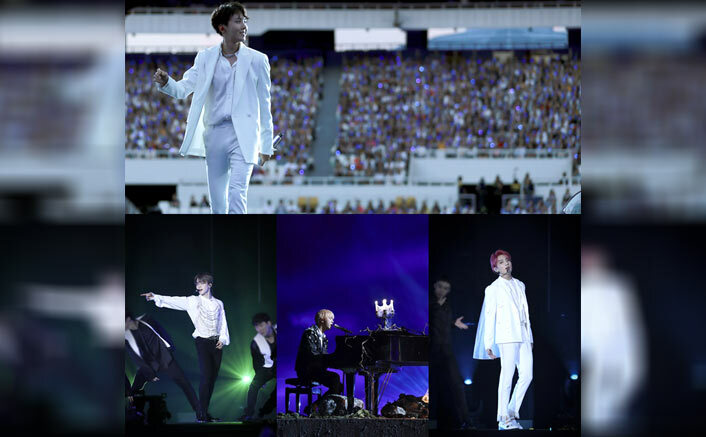 The film covered the band’s August 26, 2018, performance at the Olympic Stadium in Seoul, which kicked off their on-going 12-country concert tour Love Yourself. The tour, which promotes the album series of the same name, ends in April and covers parts of Asia, North America and Europe. The Bangtan Boys start straight away with their monster hit “IDOL”, to synchronized blasts of fire cannons and fireworks, as well as a huge group of masked backing dancers. This is a pretty good indication of what’s to come, with a high point coming in the middle section’s medley of old hits, including a funkalicious remix of “Boyz With Fun”. The best part was the singles – JHope’s “Trivia 起 : Just Dance”, Jung Kook’s “Euphoria”, Jimin’s “Serendipity”, RM SUGA and JHope’s “Trivia 承 : Love” , Suga’s “Trivia 轉 : Seesaw”, V’s “Singularity” is to die for, the stunning choreography and LED screen effect was so touching my heart, and our worldwide handsome Jin’s “Epiphany”. I was sobbing and got goosebumps for the high notes of Jin’s Epiphany. There were genuine unscripted moments peak out towards the end of the concert when the boys approach a medley of their hype songs like “Fire” and “Baepsae;” we see them laughing and engaging with the crowd. The attention to detail—not only for the stage but for the costumes as well. 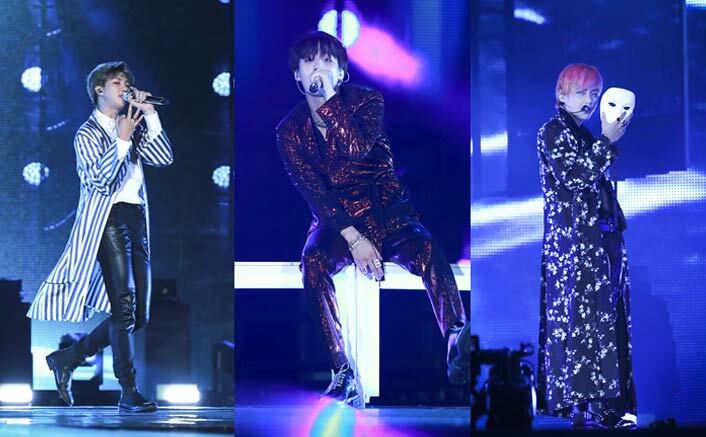 From Suga’s shimmery red suit during “Trivia: Seesaw” to every flower embellishment on Jin’s blazer during “Epiphany,” it’s hard not to be impressed by the extravagance of the production. Uri – The Surgical Strike Box Office: BEATS Aashiqui 2’s 612 % To Emerge As The MOST Profitable Of Recent Times! 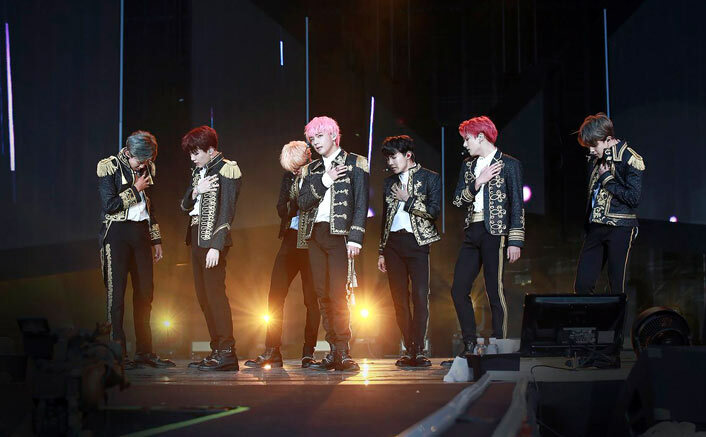 The concert film for a total of about 3 hours, cut short to 2 hours with BTS performing their songs from their latest repackaged albums as well as their previous title tracks. A total of about 28 songs were performed by our boys on stage! The boy’s energy reaches new heights during the last 4 songs. Their energetic moves to Mic Drop, So what, Anpanman, and Answer: Love Myself is to watch out for. They ended the show by singing ‘Answer: Love Myself’ and going around the stadium in carts, waving to the fans who were watching from the second and third level. Now, the negatives, the film holds no candle to what we could have witnessed live at the concert, but it’s a budget-friendly experience decent enough for those who weren’t able to physically attend the tour, or for those who simply want to sing along to the set list. Rather than an immersive experience, the film feels detached as it excludes some of the best elements of the live concert—perhaps in an effort to shorten the almost two-hour film or other external factors. If your favourite parts of the concert were the transitional films between each act, particularly the ones preceding each individual member’s performance, then you’re in for a disappointment. One of the best parts of any concert is the silence in anticipation between each song, especially if you’re previously unaware of what’s coming next. Then, the film plays and the crowd roars in excitement as the next performance is revealed. Aside from the introductory reel and the quintessential BigHit Entertainment intro, however, the film strips the viewer of that experience, quickly transitioning between each song with a black fade-in-fade-out that feels more like a slideshow than a virtual concert. The film could’ve felt more personal including even a snippet of their personal introductions, at the least. There are still a lot of elements to appreciate the concert film— as it has more than enough close-up shots of each member’s face. The camerawork soars over the uniform crowd, collecting views of the stage that you’d never be able to see in person. Because of the variety of angles, it’s also easier to appreciate the set design. BTS’ choreography is second to none in K-pop, and the live show is basically two and a half hours of non-stop high octane dancing. Despite all the spectacle of the live show, the film’s edit mainly focuses on close-ups of the boys’ faces (exposing more than a few moments of obvious vocal miming). While worldwide fans will be no doubt delighted to feel closer to their idols, the result of the filming is surprisingly uncinematic. Fans may prefer to wait for the inevitable online release, in order to watch, watch, and re-watch, at home. 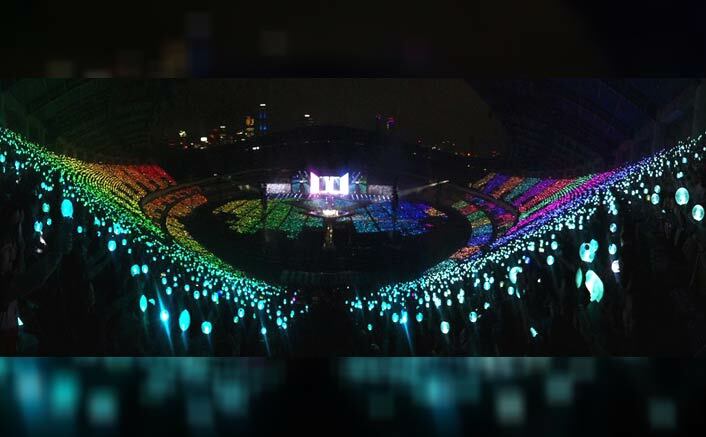 The post BTS World Tour: Love Yourself In Seoul Film Is So Good That We Are Desperate For A Concert In India appeared first on Koimoi. Previous ArticleUri – The Surgical Strike Box Office: BEATS Aashiqui 2’s 612 % To Emerge As The MOST Profitable Film Of Recent Times! Next Article Uri – The Surgical Strike Box Office (Worldwide): With 248 Crores, Vicky Kaushal BEATS Shah Rukh Khan, Ranbir Kapoor & Tiger Shroff!